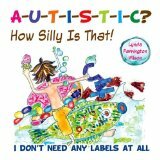 Picture book about labelling children with autism published by Future Horizons Inc.
Author-illustrator Lynda Farrington Wilson is a mother of a funny, brilliant, and talented sensory seeker who has autism. In A-U-T-I-S-T-I-C? How Silly Is That! 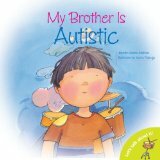 I Don’t Need Any Labels at All she challenges readers to examine the labels we often attach to people on the autism spectrum. Asking, I have brown hair, I wonder if that makes me… brown-hair-tistic? she asserts that there are many ways we might choose to label individuals but, in fact, labels are unnecessary. A child with autism is not unlike everyone else, he simply has a different approach to the world. A-U-T-I-S-T-I-C? How Silly Is That! I Don’t Need Any Labels at All includes seventeen pages of exhuberantly illustrated text. It also includes an author’s note which explains that Ms. Farrington Wilson’s goal of encouraging the world to see past the labels and understand the importance of “people-first” language. My Brother Charlie is written from the perspective of Charlie’s twin sister. She explains that she and her brother share many things. She also explains that there are some ways they are different. “Charlie is skinnier and goofier than me. When he looks at the sky, he finds jets and helicopters. Charlie’s sister explains how he was different as a baby and that the differences between the two twins caused his parents to be concerned. She explains, “It’s harder for Charlie to make friends. Or show his feelings. Or stay safe. One doctor even told Mommy that Charlie would never say I love you.” We learn that it can be difficult to be Charlie’s sister and that she would love to be able to change him. The story of My Brother Charlie is told candidly, respectfully and lovingly. 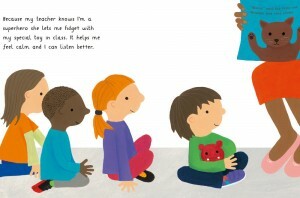 It is an excellent book to share with children aged four and up. My Brother Charlie could be used to introduce a discussion about Autism or to encourage tolerance for those who may appear or behave differently. Sam, his sister Emma and their parents live in a house with a red door. Sam was a happy boy but he was a little different. 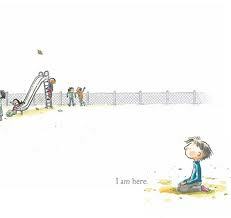 We follow Sam through his week and learn that he has difficulty making friends, he can become “stuck” and reluctant to change. Sam notices when his clothes feel scratchy and when his classmates tease him. He finds being in school challenging at times. One evening, without his parents knowing, Sam leaves his house and walks away. His family worries as they scramble to find him and to keep him safe. This incident, together with his difficulties at school, precipitates a visit to the doctor. Sam is assessed and, before long, the family learns that Sam has Asperger Syndrome, a form of autism. Understanding Sam and Asperger Syndrome is an appropriate story for children in preschool, kindergarten and early primary grades. It provides readers with perspective on the challenges faced by Sam, his family and his classmates. As well, Understanding Sam and Asperger Syndrome celebrates Sam’s abilities. At the conclusion of the story, readers are offered 10 Helpful Tips including Treat your friend as a regular kid, take turns, and “change is hard, hang in there.” The tips are each accompanied by a one or two paragraph explanation.